Redmond became a co-owner of SPI, when Jim Dunnigan, realizing he needed a good graphic artist, offered Redmond half of the business to join him at SPI. Redmond was best know for his graphic design, but also is credited as a designer of several games. This list will concentrate on the games where Redmond was listed as a designer. Redmond is also the person to coin the term, "Game Designer" and was the creator of the Case System still used to organize game rules today. 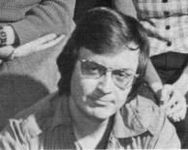 He was also the editor of most SPI games and magazines. Game Designer Greg Costikyan has said Redmond was the best artist he ever worked with and he was more than just the artist, but was a collaborator in the game design. That collaboration reached a level in the following games that Redmond was listed as a co-designer, and not just the artist. As a result, you won't find him listed as the sole designer often, but nevertheless he was a significant contributor to hundreds of games. Unfortunately, heart failure took him from us at the much too young age of 62. I highly recommend you read his biography at the HOF site for more information about this giant of the wargaming community. 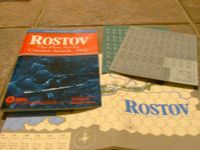 I started playing war games in 1970. Redmond and SPI gave me many hours of enjoyment and doing this list has given me the desire to pull out and play some of those older games. Looks like a photo from the SPI days. Russ Gifford geeklist that lists Redmond's best as a graphic artist. More of an economic-political game. From what I've read, you can build armies, but it's quite the drain on your economy. Hypothetical setting. Part of the Westwall quad. You can play this one at Hexwar.com. Generally a well received game. Sci-Fi game that was liked by many, but the double charts to track 3-D movement was a confusing turn-off for others. Part of the Napoleon at War quad. Reissued in 2010 by Decision Games. Also available at Hexwar.com. The first game on the list I remember playing. I haven't played it since the 70's, so specifics escape me, but I do remember enjoying it. Part of the Blue & Gray quad. Consensus is B&G weren't particularly accurate simulations, but were fun. And this is considered to be one of the better B&G games. Yet another quad game, this time from the Battles of North Africa quad. A paragraph based solitaire game published in Ares magazine. Tactical warfare in North Africa. Uses SiMov, which sounded better than the cumbersome reality. Dislike for the SiMov system is reflected in the ratings. One of the few games where Redmond was the sole designer. Unfortunately, it was also pretty much universally panned. However, published variant rules are said to improve the game greatly. The alternate history setting, where the South won the Civil War, probably didn't help. Published in S&T 54. Based on the movie, the game was intended to have an RPG feel, as players had to collect items in order to defeat the dragon. Sounds reasonable, but was boring based on many comments. Hypothetical war in the 1970's, but instead of pitting Russia against NATO, it's Russia vs. China. Published in S&T 42. One of the higher rated games on which Redmond was listed as a designer. It's a multi-player wargame for up to 6 players, but can be played solo, as well. Sounds like it is more of an economic-political game, rather than a wargame. It was republished by Decision in 2004. Expect to spend a lot of hours for the campaign game. Hidden units and dummy counters add to the tension. However, there are many comments the game has not aged well. Still, many more positive ratings than poor ratings. Another from the West Wall quad. One comment said he didn't see how the American could win, while another said a US victory was a sure thing. Said to be a slog, which you would expect in Hurtgen Forest. Originally published in S&T 75. Two separate games with a common core of rules and then specific rules for each game. Simpler game with a wide variance in the ratings. Published in S&T 78. Part of the Victory in the West series, which is generally well thought of. I still have this one, unpunched, but I may need to change that. Uses chit pull for unit strength, giving some fog of war. There are quite a few fans of this series, but I've yet to try it. It's a shame VASSAL modules aren't allowed for the SPI games. Also from the West Wall quad, but considered the worst of the 4. US has a perimeter line they can't cross, which wasn't too popular. From SPI's Moment in Conflict series. Not a lot of copies registered on BGG. This was John Butterfield's first game, with assistance from Redmond. Pretty good rating for an older game. From the Blue & Gray quad. There are a lot of newer games on Shiloh now, but this was one of the first. Available on Hexwar. Decision republished this as Shiloh: Grant Surprised, but the newer game is rated well below the original. B&G is pretty dated at this point. Redmond was the sole designer on this one. Fantasy war game for 1-6. Board is interesting to say the least. Hexes as a bunch of pastel colors. Can't totally blame Redmond, as 5 artists get credit for the graphics. Considered under rated by many. Comes with teams from the 1958 season and 4 super bowl teams. A couple of folks have created additional teams. Published in Ares #12. Lots of 10 ratings for this one and not easy to find. A Sci Fi economics game.